With this programme you are going to gain lean body mass, lose fat, improve fitness and define your physique. All of this using just a barbell! In this workout plan, we are going to be giving you step by step instructions for exercises and a programme that will benefit you. These are easy to perform, even in the comfort of your home. Follow the instructions closely, and you will start benefiting in a short period of time. The programme is a perfect tool as it fits the ability to perform at any time of the day and does away with the “busy schedule” excuse as well. Rest time between sets and exercises must be 30-90 seconds depending on your conditioning level. Increase or extensively decrease the speed of the movement. Decrease time of rest between sets and exercises. Add weights to the barbell. Drop Sets: place many plates on each side of the barbell (as much as you can lift for 6-10 repetitions). Perform repetitions till concentric failure then immediately remove one plate from each side and without rest continue the exercise to failure and again remove one more plate from each side. Continue this procedure until you’re out of plates. Exhaustion-Set System: perform as many repetitions as possible with good technique until concentric failure occurs. Burn System: perform a set till concentric failure, then proceed with half or partial repetitions. Pyramids: Start with a set of 10-to-12 repetitions with a light resistance, which is increased over several sets so fewer and fewer repetitions can be performed, until reaching 1 repetition maximum. Then repeat the same sets and resistances in reverse order, with the last set consisting of 10-to-12 repetitions. Super Slow System: perform very slow repetitions ranging from 20-to-60 seconds per repetition. Super Setting Systems: In the first type, you use several sets of two exercises for the agonist and antagonist muscles of the body part. In the second type use one set of several exercises in rapid succession for the same muscle group or body part. Related article: Which Meat Is The Healthiest? Stand with the bar across your shoulders, resting on your fingertips as shown. It’s a light grip, but don’t even think about dropping the bar. Now place all your weight through your heels as you bend your knees and push your hips back – sink as low as you can, but keep your back straight. Push through the heels to drive back up. Stand tall with the bar at your waist and a slight bend in your knees. Now shift your hips back and let the bar slide down your legs. Stop when your hamstrings tighten. Drive your hips forward and squeeze your glutes to stand back up. With your feet hip-width and shins touching the bar, bend down to grab it. Your index fingers should rest on the outer ring of the knurling. Pull your hips down and raise your chest. Take a deep breath to stabilise your lower back, then drive up, thrusting your hips. Straighten your knees, then slide the bar back down the front of your legs to the start position. Stand with the bar across your upper back, pulling it tightly into your traps. Step one leg out; let the heel of the opposite leg take your weight. Push your hips down, keeping the trail leg straight and foot flat. Drive through the heel of your bent leg to stand back up. 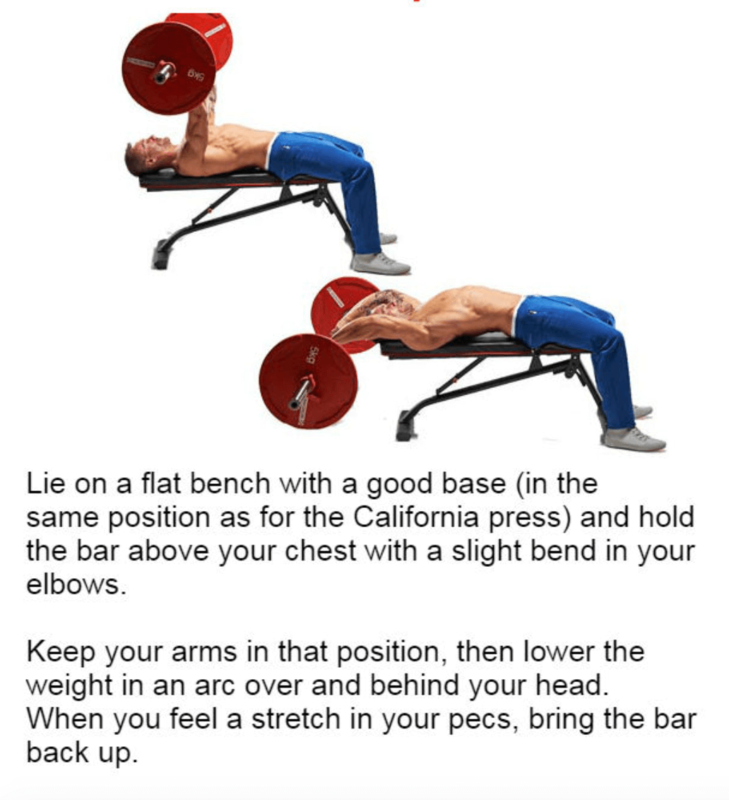 Lie on a flat bench with a good base (in the same position as for the California press) and hold the bar above your chest with a slight bend in your elbows. Keep your arms in that position, then lower the weight in an arc over and behind your head. When you feel a stretch in your pecs, bring the bar back up. 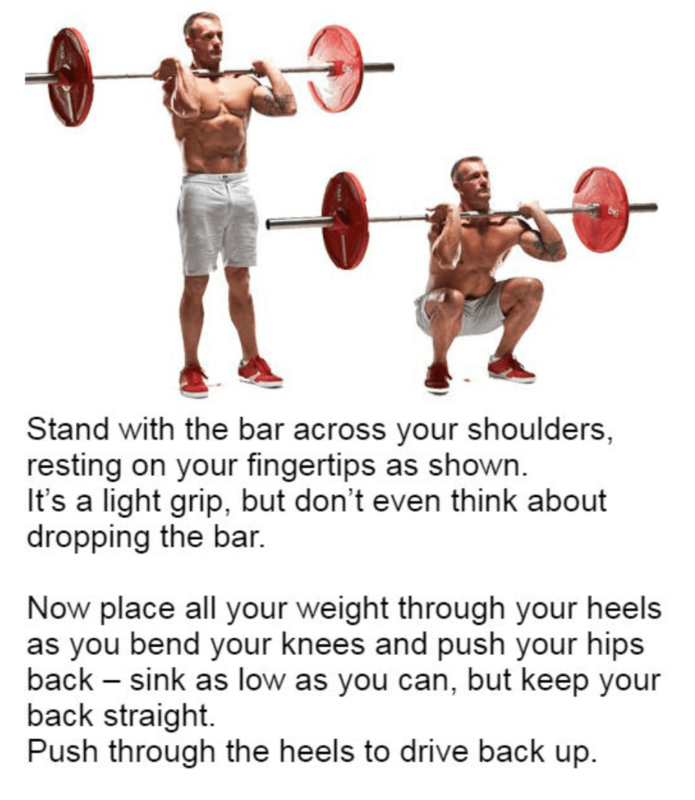 Hold the bar across the back of your shoulders, then lean forward and push your hips back as far as possible. When your hams start to tighten, push your hips straight forward and bring your chest up as you straighten. 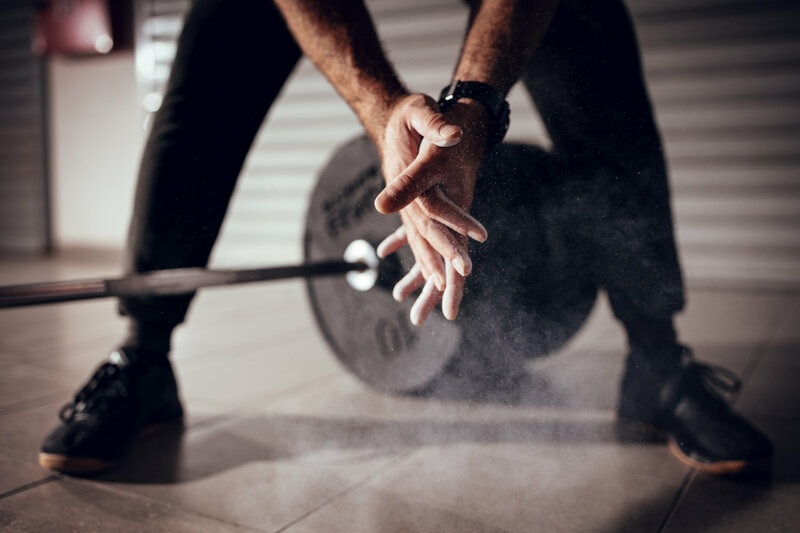 Start the same as the power clean, generating momentum from your knees, hips and shoulders to drag the bar up from the floor close to your body. 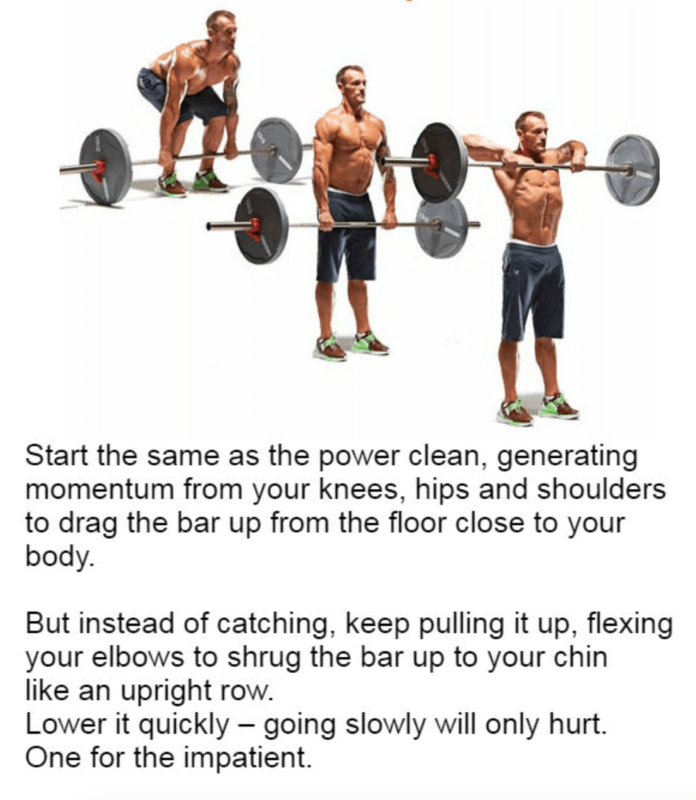 But instead of catching, keep pulling it up, flexing your elbows to shrug the bar up to your chin like an upright row. Lower it quickly – going slowly will only hurt. 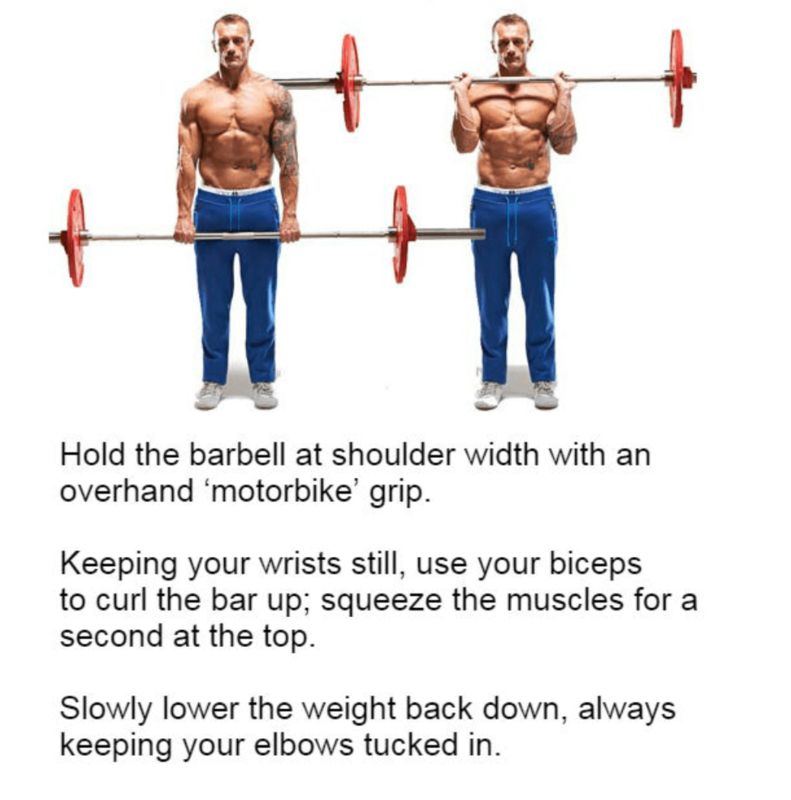 Hold the barbell at shoulder width with an overhand ‘motorbike’ grip. Keeping your wrists still, use your biceps to curl the bar up; squeeze the muscles for a second at the top. Slowly lower the weight back down, always keeping your elbows tucked in. 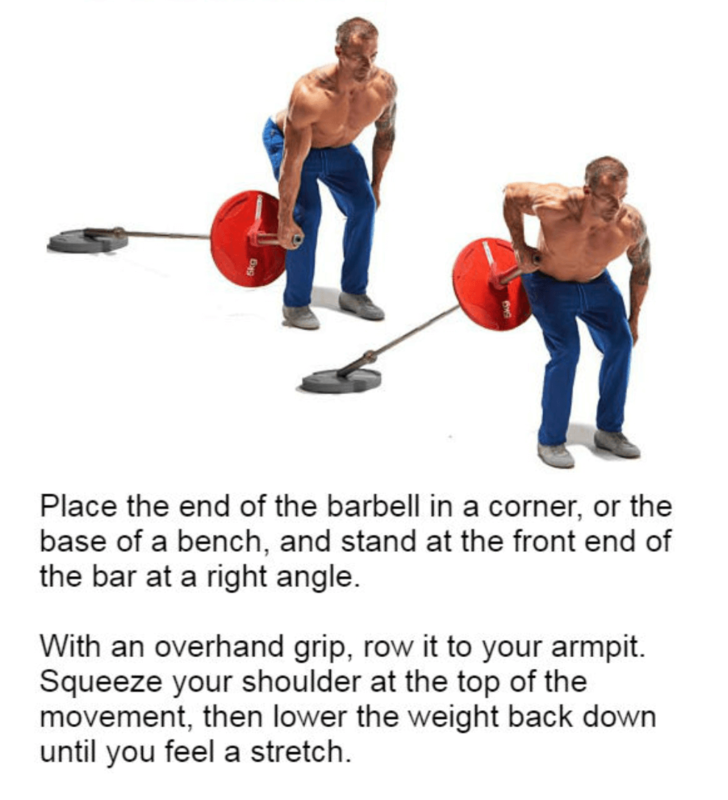 Hold the barbell at your waist, slightly wider than normal with an overhand grip. First, row it up to your belly button. 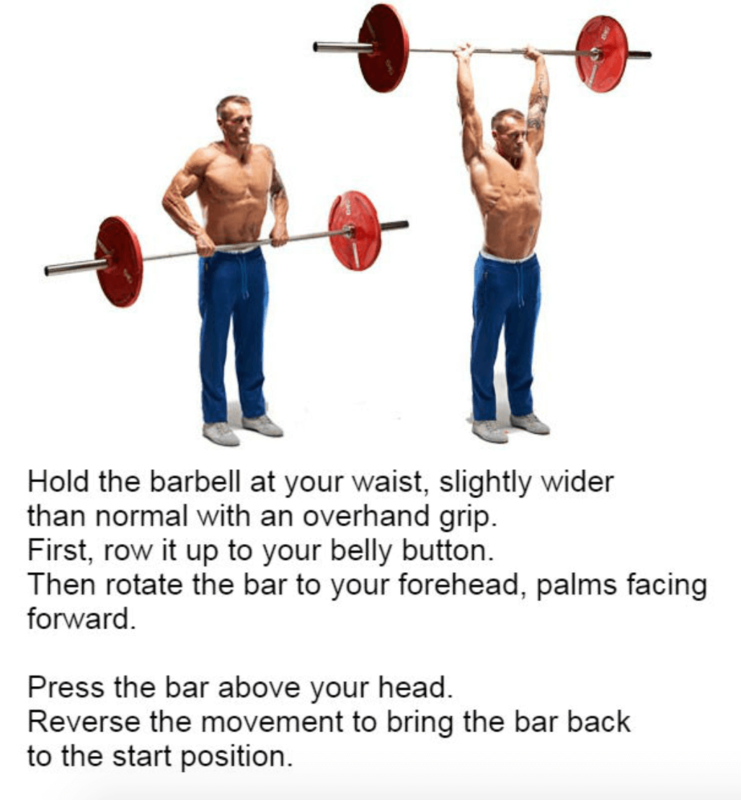 Then rotate the bar to your forehead, palms facing forward. Press the bar above your head. 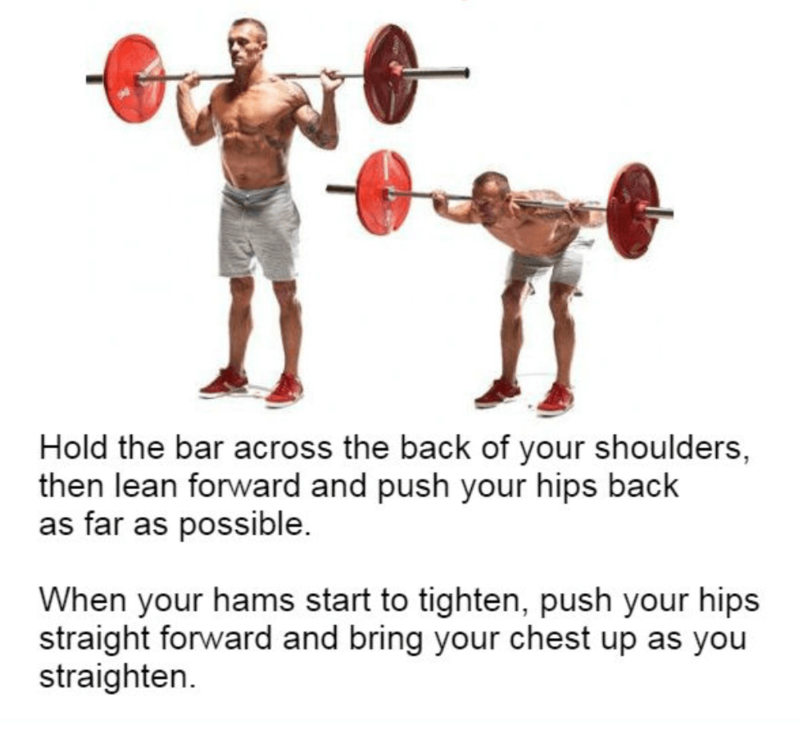 Reverse the movement to bring the bar back to the start position. Sit with your knees bent and upper back resting on a bench behind you. Roll the bar on to the top of your hips and hold it in place. Now push your feet down, lifting your hips up until your upper body is fully supported by the bench. Squeeze at the top for a second and slowly lower back down to the floor. 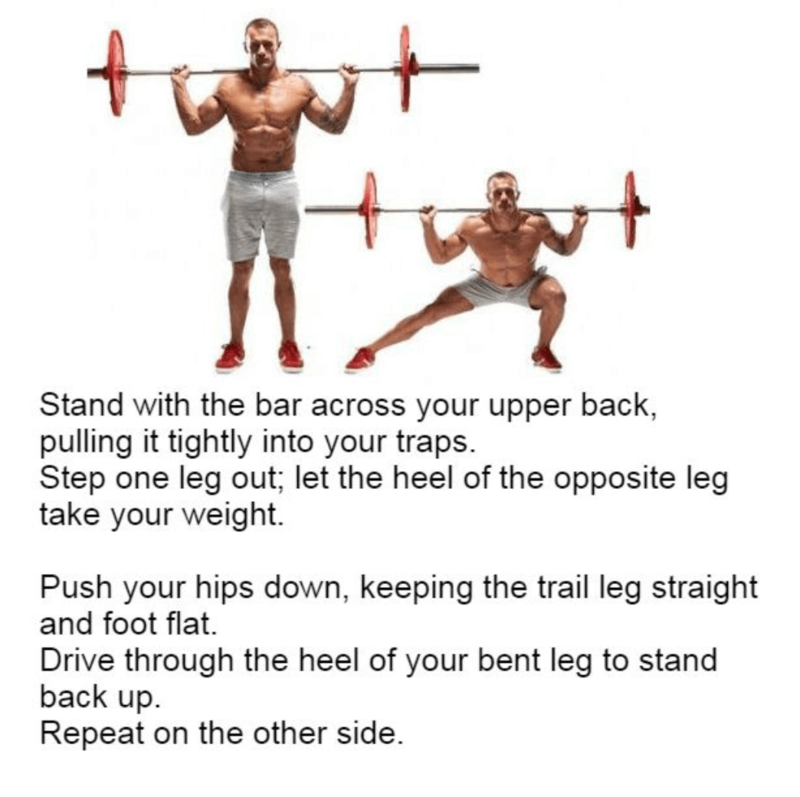 Place the end of the barbell in a corner, or the base of a bench, and stand at the front end of the bar at a right angle. With an overhand grip, row it to your armpit. Squeeze your shoulder at the top of the movement, then lower the weight back down until you feel a stretch. 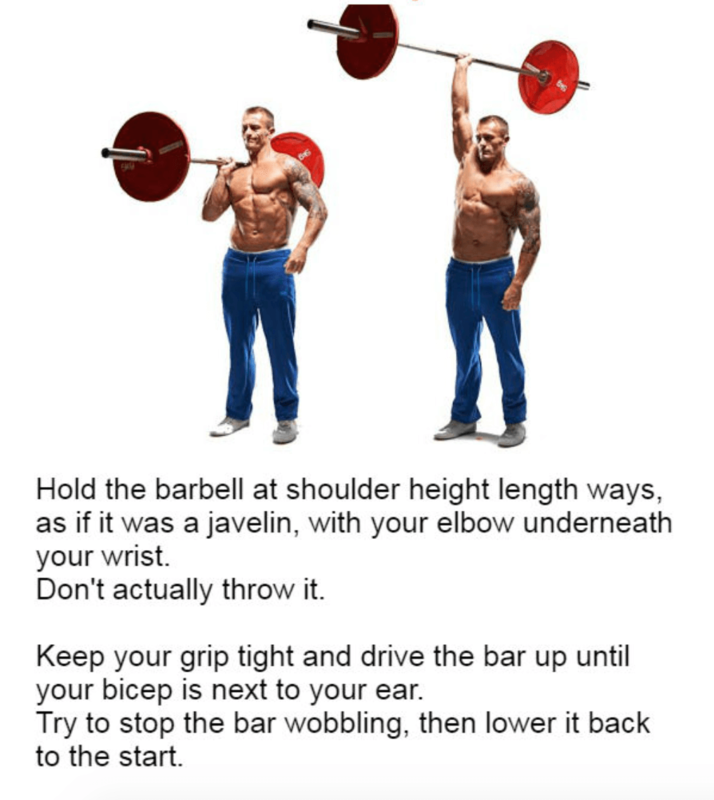 Hold the barbell at shoulder height length ways, as if it was a javelin, with your elbow underneath your wrist. Keep your grip tight and drive the bar up until your bicep is next to your ear. Try to stop the bar wobbling, then lower it back to the start. 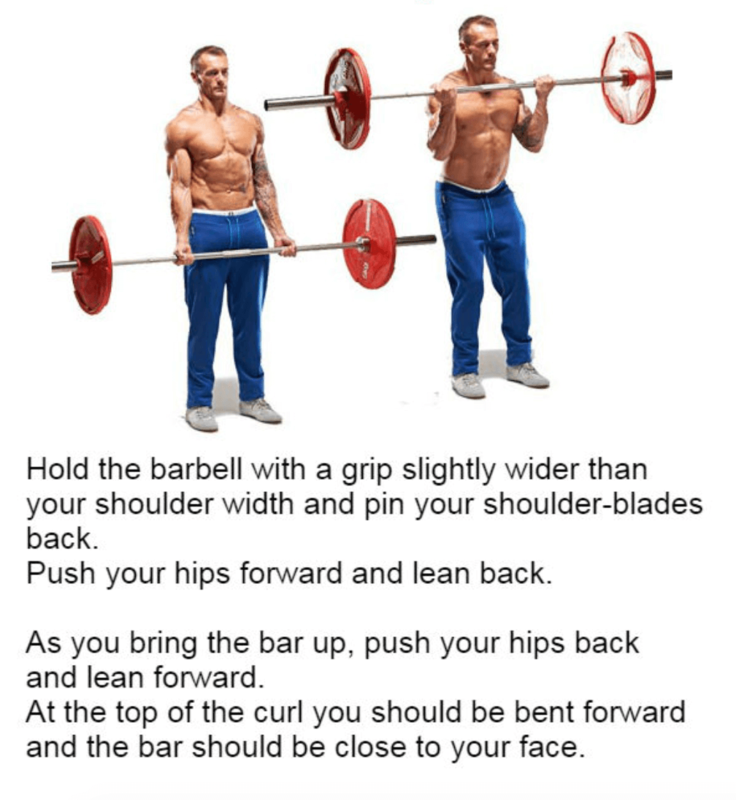 Hold the barbell with a grip slightly wider than your shoulder width and pin your shoulder-blades back. Push your hips forward and lean back. As you bring the bar up, push your hips back and lean forward. 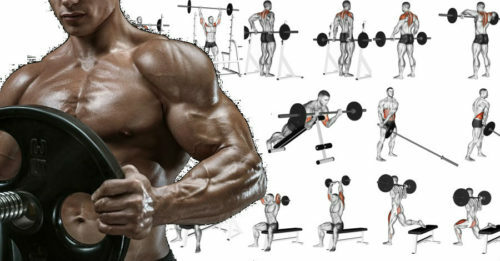 At the top of the curl you should be bent forward and the bar should be close to your face.